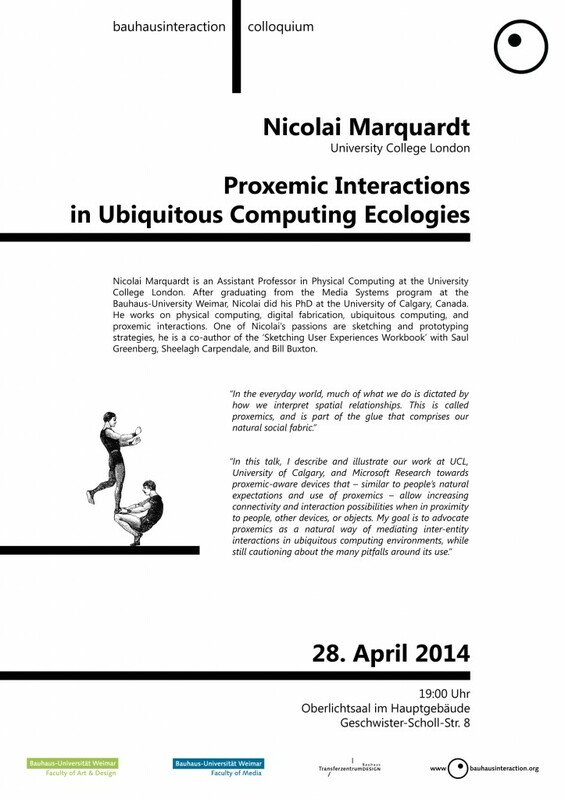 Nicolai Marquardt is an Assistant Professor in Physical Computing at the University College London. After graduating from the Media Systems program at the Bauhaus-University Weimar, Nicolai did his PhD at the University of Calgary, Canada. He works on physical computing, digital fabrication, ubiquitous computing, and proxemic interactions. One of Nicolai’s passions are sketching and prototyping strategies, he is a co-author of the ‘Sketching User Experiences Workbook’ with Saul Greenberg, Sheelagh Carpendale, and Bill Buxton. When designing user experiences, hand drawn paper-pencil sketches are an invaluable tool for finding the right design; long before refining the work and getting the design right. In this hands-on workshop will learn how to integrate sketching into everyday design and research practice. You will hear stories about inspiring sketches from designers, inventors, and scientists: Alexander Bell, Thomas Edison, and many others. You will learn essential sketching strategies and shortcuts (e.g., sketching vocabulary, photo tracing, hybrid sketches, and storyboarding) and apply these in practice during various hands-on exercises. Throughout the workshop you will hear about the various ways of using sketches as a powerful tool when designing for novel user experiences – in particular with interactive surfaces such as phones, tablets, and tabletops. No previous sketching experience required – but please get paper and pencils ready for the many hands-on exercises throughout this two hour workshop. Please REGISTER FOR THE WORKSHOP by sending an email to michaela.honauer@uni-weimar.de with the subject ‘Sketching workshop: registration’ by Friday the 25th. Places are given on a first come first serve base. This talk and the workshop are part of the Bauhausinteraction Colloquium.